In an effort to make it easier for people from all over the world to create and share information in their language of choice, Google has created Noto, a massive open source font family that spans more than 800 languages and 110,000 characters. That covers every single symbol in the Unicode standard today. 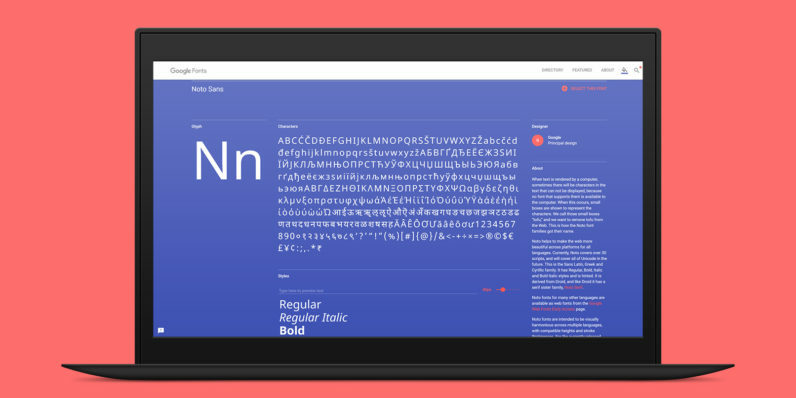 The project, which Google took up to make Android and ChromeOS more accessible, took five years to complete and saw the involvement of typography and font design experts from Monotype and Adobe. The name Noto comes from the phrase ‘No more tofu’, which refers to ridding the Web of blank characters (‘⯐’ , a.k.a. tofu), which are displayed when the necessary symbol from a certain language isn’t available on the user’s system. Noto offers an elegant, unified look across languages and is free to use for any sort of project. The entire font family, with all its weights and styles, comes in in at a hefty 472MB (the largest packages include Traditional Chinese, Simplfied Chinese and Korean characters). You can grab them all at once or pick only the ones you need; if you only want English, you can just pick up the first three tiny packages. Google has also made those available through its excellent recently revamped Web Fonts site. Plus, Noto is open source and you can download the design source files from this GitHub repository. The company says it’s committed to keeping Noto up to date and will continually add to it as Unicode grows to support more languages and characters.